It has been a good week for Aardenburg Imaging and Archives. HOBO® data loggers arrived from Onset Computer Corporation. The first order of business was to check the calibration of the light sensors. I wasn’t expecting much accuracy from the HOBO® model U12-012 data loggers because Onset does not claim any more than a relative light level sensor even though the software graphs the output in precise photometric terms of Lux or Footcandles. It turned out to be a good news-bad news-good news story. The good news is that the sensor is fairly linear and will be relatively easy to calibrate with enough accuracy for this research project. The bad news is that it is way off in its light level calibration, so much so that, in my opinion, the HOBO® software shouldn’t even attempt to express output in terms of photometric units. More bad news is that the light sensor’s range isn’t great enough to cover the real world situation where sunlight entering through a window strikes the picture frame directly. Still more bad news is that even with a storage memory of approximately 43,000 individual readings, trying to record temperature, relative humidity, and light level with one data logger at the appropriate incremental time intervals for this research project results in a total field deployment time that is shorter than I would like. The work around needed to resolve these issues means that two data loggers will be needed for each picture frame. One unit will be matched to a neutral density filter that captures the highest possible light levels while the second unit will be reserved to monitor light levels as low as 10 Lux. However, the good news is that the use of two data loggers solves another underlying issue, namely the problem of light level non-uniformity across the print due to real world lighting conditions that can often be quite far from uniform. The mid range of both sensors will overlap such that light uniformity data can be derived from the dual sensor location within the picture frame. I have some special picture frame components on order, but in my desire to get started I grabbed a picture frame that has actually been displayed in various homes we have lived in over the years . 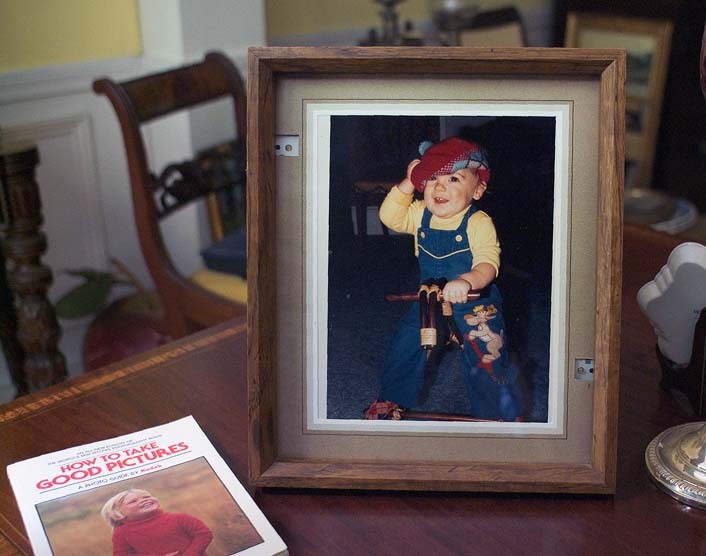 The frame is a very inexpensive picture frame like those that can be purchased at any Walmart, Kmart, Target store, etc. It can be hung on a wall or placed on a table. I hand cut openings in the back which allowed the HOBO® data loggers to be press fit snugly into place. A spring clip also will be added to the production unit in order to ensure that the units remain in place yet are quite easy to remove. Why not just locate the data loggers on the wall or desktop right beside the frame? Wouldn’t that be easier? The answer is yes it would be easy, but the placement of the data logger sensors inside the frame allow it to more closely record the microclimate seen by the print inside the frame. Microclimates are created when moisture buffering materials like paper, wood, gelatin, acetate, etc. are not freely exposed to their surrounding environment. The picture frame backing board and the front cover of glass or acrylic helps to create a unique microclimate that can differ significantly in temperature and relative humidity from the room environment where the picture is located. We want to study that environment where the print resides not the room itself, so the intimate contact of the data loggers with that environment is preferred. The first data logging picture frame constructed at Aardenburg Imaging & Archives uses an inexpensive picture frame. One can see two small yellowish-green “buttons” near the upper left and lower right corners of the frame. These are the light sensors. The adjacent black buttons start the loggers just prior to inserting into the frame and also record a “button pressed” time stamp when the loggers are removed from the frame for data readout. The aperture port on the data loggers that allows air and moisture to reach the temperature and RH sensors are hidden and in contact with the back of the matte board (ie. a cheap, non-archival colored paper in this example) and the photograph. The light vignetting by the deep picture frame will be solved in the production units simply by using a picture frame with much flatter front edge profile and by locating the sensors further away from the edge. 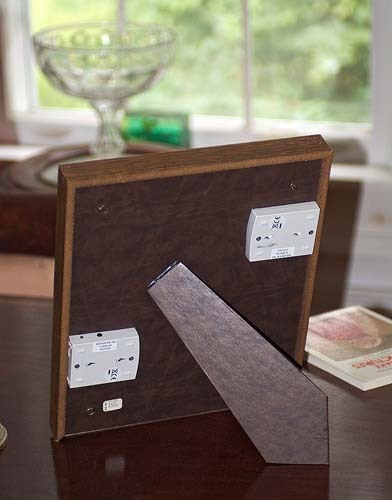 Two HOBO® data loggers press fit snugly into place to monitor temperature, humidity, and light levels within the microclimate of the picture frame. 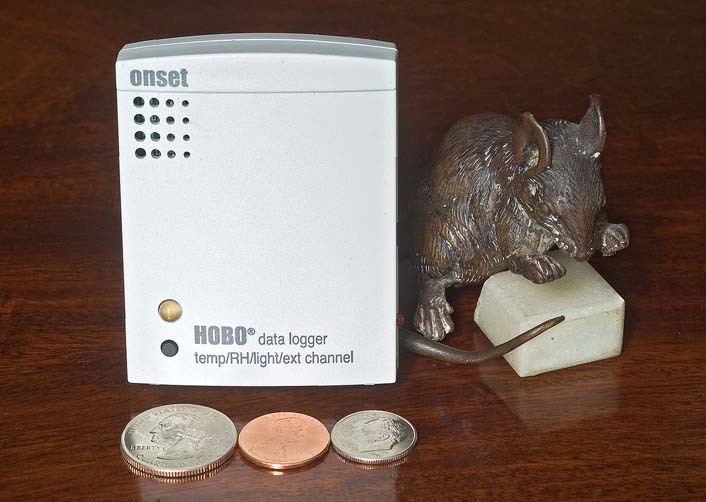 The dimensions of the HOBO® model U12-012 data loggers are 7.4 cm x 5.8 cm x 2.2 cm (2.9 in x 2.28 in x 0.87 in), not much bigger than a mouse and his cheese! It has temperature, relative humidity, and light sensors and is very inexpensive (less than $100 dollars in reasonable quantities) compared to almost any other loggers on the market today. One can buy a less expensive logger if one needs to measure only temperature and/or RH, but I have not identified any unit that measures all three properties of light, temperature, and RH for roughly equal or less money. Moreover, the pro software (both Mac and PC compatible) is fairly sophisticated considering the relatively low price of the Onset Computer data logger family of devices (they didn’t pay me to say this). My evaluation of the HOBO® model U12-012 data loggers confirmed that light levels recorded by the factory delivered units have significant errors that requires more than a single value offset. However, they can be easily calibrated provided that suitable instrumentation is available. Aardenburg Imaging uses the model PMA2210 radiometer manufactured by Solar Light, Inc. 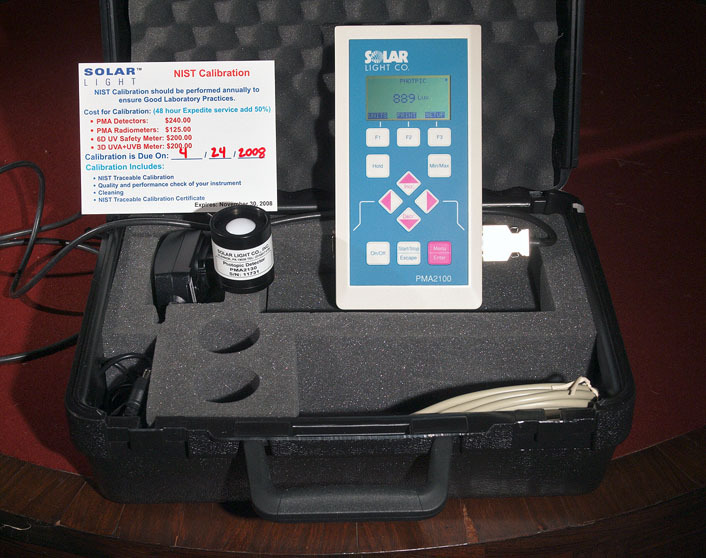 This unit and its matching photometric and radiometric sensors sensors meet the specifications for National Institute of Standards and Technology (NIST) calibration traceability. The final image in my post today shows a “Real World” deployment of the Aardenburg data logging picture frame. 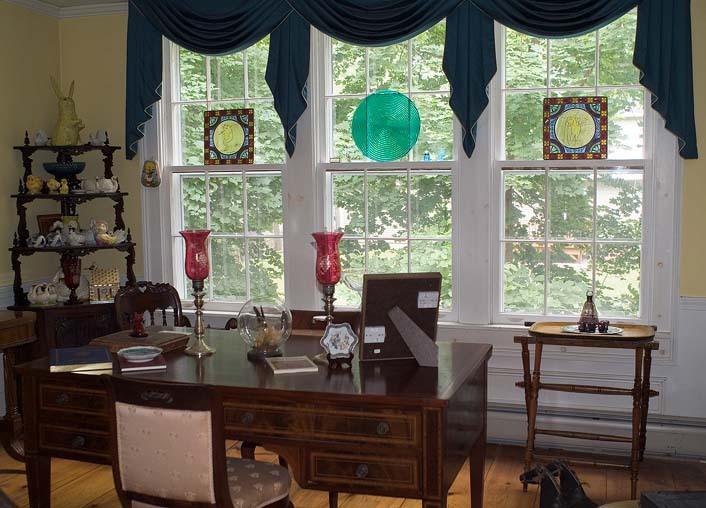 One can see the prototype picture frame sitting on a desk in the “keeping room” of the Hyde house, the corporate headquarters of Aardenburg Imaging & Archives. The desk in the scene belonged to my grandfather, Frederick H. McCormick-Goodhart. It’s design is sometimes called a “partners’ desk” because it has room to be seated on either side. I elected to put the data logging picture frame at this location to underscore a couple of very important points about photographs in the real world. First, my choice of location was based on the premise that we display photographs wherever we want for decorative and sentimental reasons. In this case, my grandfather’s desk is a fitting location. Yet I do not use this desk as my primary work space. I do use it from time to time to write letters, pay a few bills, etc. I usually like the light from the windows behind me when I perform these tasks, so the photo in the frame is pointed towards the windows. However, I could have just as easily elected to sit at the other side of this desk or simply decided to orient the picture frame so that more visitors sitting in the “keeping room” of the Hyde house would be able to see the photo. In this case the picture would be facing the other direction. Measurements I have made at various times of the day indicate that there is almost always a 10 to 1 reduction in light level when the picture faces away from the windows rather than towards them. Simply by turning this picture frame in a slightly different direction I can alter its light-induced deterioration by an order of magnitude! This situation is a very good example of photographs in the real world, and why Aardenburg Imaging & Archive’s digital print research project is now getting started. Chances are good that over the remaining lifetime of this photograph as it goes forward from today it will from time to time face inward and at other times face the window. How can we evaluate its print aging environment if we don’t monitor it? Indeed, if I could provide a provenance for this photograph, it would show that this photo has already been in numerous locations and in more than one home setting during its display life to date. The total variability of light induced exposure can easily be two or three orders of magnitude. Add temperature and relative humidity variations, and how accurately can one expect to extrapolate a laboratory test result when the real world is playing such tricks? Multiply by the sheer multitude of different geographic locations, building designs, and climate variations, and one can see that gathering real world print aging data is a huge, very huge statistical game. That is the game Aardenburg intends to play by working towards the deployment of thousands of data logging picture frames! This week, I deployed picture frame prototype # 1 into the real world. I need your help to locate thousands more production units. They will be similar in function to what I have shown here only better. I am starting with a small scale pilot program that will help work out the kinks, and gear up ultimately for massive statistical analyses of the data. In subsequent posts coming in the next few weeks, I will show you the kinds of image data Aardenburg will be tracking and analyzing. Please consider becoming a participant in this exciting, interactive research. Participants will sponsor the deployment of one or more data logging picture frames in the real world. The frames will contain a digital print, data logger(s), and embedded color target data. The cost will be $500 per picture frame for the pilot program. Email me at info@aardenburg-imaging.com and add the subject line “Pilot Program” to tell me a little about your background and interest in participating and to learn more about Aardenburg’s pilot study now getting underway as the beginning of our much larger and more ambitious Digital Print Research Program. Aardenburg Imaging’s Prototype #1 data logging picture frame resting on the partner’s desk in the keeping room of the Hyde House. Temperature, relative humidity, and illuminance levels are being monitored in 10 minute intervals.